Matai Sports Netball uniform range is widely recognised for its quality, durability and value for money. All netball uniforms are designed with comfort and freedom of movement in mind. 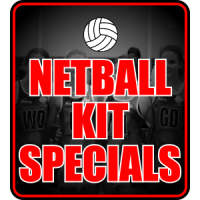 Matai Sports can supply custom netball uniforms including netball dresses, netball skirts, netball tops, netball bibs and netball socks, all in your netball team colours. Choose from our standard designs or have our in house designers come up with a unique look just for your team. We can also supply on trend, matching team uniform accessories in your desired colours to really make a statement and have you stand out from the rest. Feeling creative? Take a look at our Design Your Own section using Kit Builder Its an easy 3 step process, to selecting your design, customising your colours and uploading your logos. It's fun, easy and a great way to visualise your design before getting it made. CUSTOM MADE NETBALL TEAM UNIFORM PLAYING KITS DISPATCHED IN JUST 3 WEEKS!